There’s been a ton of talk about the potential impact of Dominaria mythics such as Karn, Scion of Urza, Mox Amber and History of Benalia, but the fact is that these are expensive cards that we really just don’t know for sure will live up to their hype over the long run. Mike Flores of Gathering Magic wrote an extensive article on the tremendous impact he believes that this card will make. One of his biggest takeaways from the article is that you need to be prepared for a dominating card like this and have an answer for it, and I couldn’t agree with him more. Countermagic and hand disruption are the primary ways you’ll be able to answer it. There isn’t much you can do once it resolves, outside of River’s Rebuke. While this card may not own Standard, it’s going to see a good amount of play. Don’t let this card slip out of your radar as the meta develops! I’m not one to offer financial advice on Magic cards, but $16 feels like a complete bargain for a dual-colored planeswalker that protects itself, draws you cards, and has an ultimate that can end the game (an ultimate that isn’t a pipe dream to achieve). EDIT: This article was originally written prior to SCG Atlanta. Given the results of that tournament, the price on Teferi has since spiked to $35+. 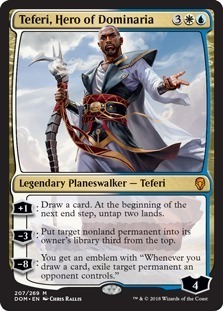 Teferi is naturally built for control, but he is absolutely going to be another bomb in midrange strategies. It’s all fun and games until your opponent has a strong board presence and then resolves a planeswalker that draws more cards. Standard is going to be defined as decks that are either with Teferi or against Teferi. Choose a side and stick with it. And for you Modern players, don’t be surprised if you see the new Teferi show up in Jeskai Control lists. He really is THAT good. 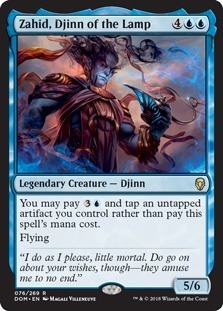 When I first played Magic back when I was 11 or 12, Mahamoti Djinn was my DUDE. A 5/6 flier that can brawl it out with Shivan Dragon was a card I always wanted in my deck. Of course, the high CMC was a hurdle. Fast forward 24 years, and my dude is back with a new name and a huge way around that hurdle. Pay 3U, tap an artifact and this guy just beat your opponent’s 6 drop – AND their 5-drop to the battlefield. How cool is that? 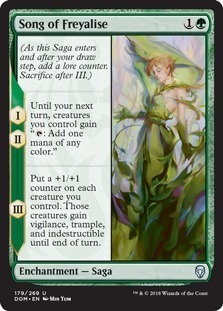 If you love Token or ramp strategies, you’re going to love Song of Freyalise. 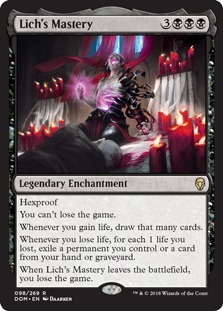 The biggest problem with this card is that it doesn’t stack well if you have multiples, but played early you can cast some huge threats in a flash (Darigaaz Reincarnated, anybody?). Some other ideas involve landing a giant Nissa, Steward of Elements and ultimating right away, or simply wielding a giant Walking Ballista. Song of Freyalise is a brewer’s gem, for sure, but this card is going to show up early and often in a good amount of your Standard Matches. The old goblin boss is back and he’s still seeping with value. Yeah, it’s a 2/2 for 5, but the reality is that it gives you FOUR bodies for five mana. And you have the ability to sac one of those at any time to get in a quick two damage on ANY target. 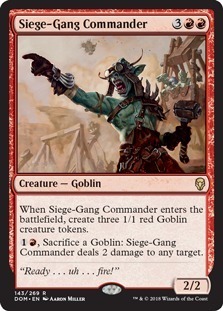 You can go all out Goblin tribal with him, or get him in your mono red or RB midrange decks as a late game finisher that also helps gives you a cushion against go-wide strategies. This is one of those hyper versatile cards that will absolutely make an impact in Standard. What are some cards you think will make an impact in Standard? Or maybe there are some cards from Dominaria that you’re just plain psyched about. Reply to this email and tell us all about it, or share it on the MTG Pro Tutor Facebook Group Page. And if you haven’t already, be sure to subscribe to the MTG Pro Tutor Newsletter, and ask your friends to do the same. 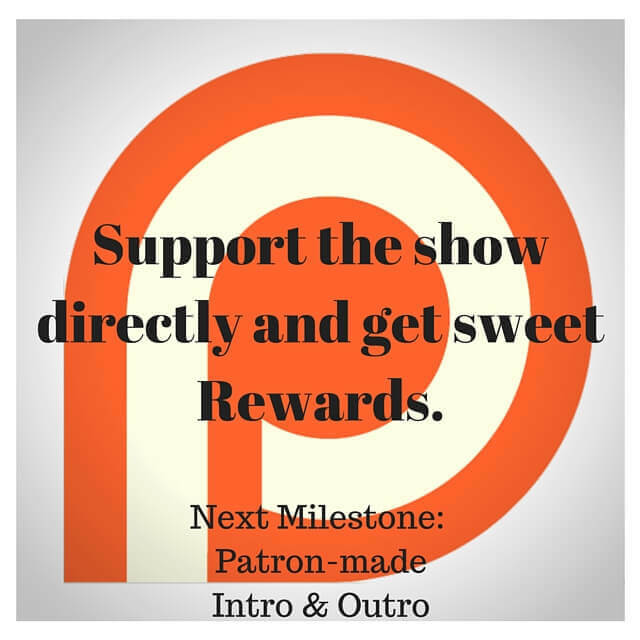 Every week we’ll send great tips and insights like these directly to your inbox. All for FREE.